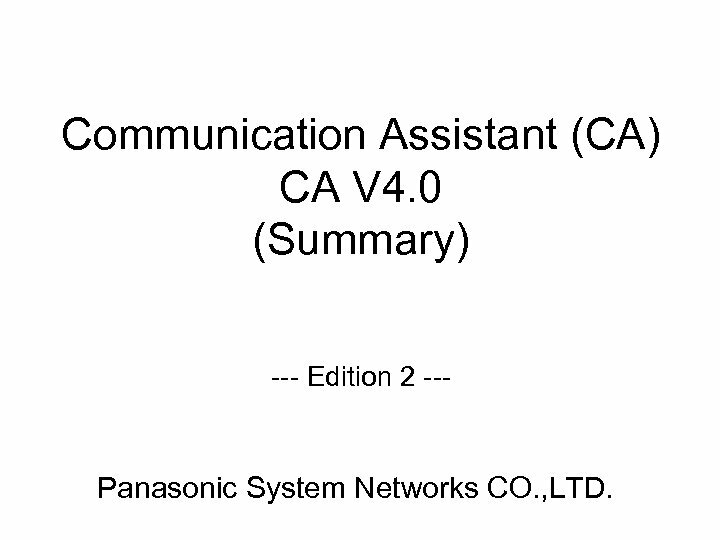 Communication Assistant (CA) CA V 4. 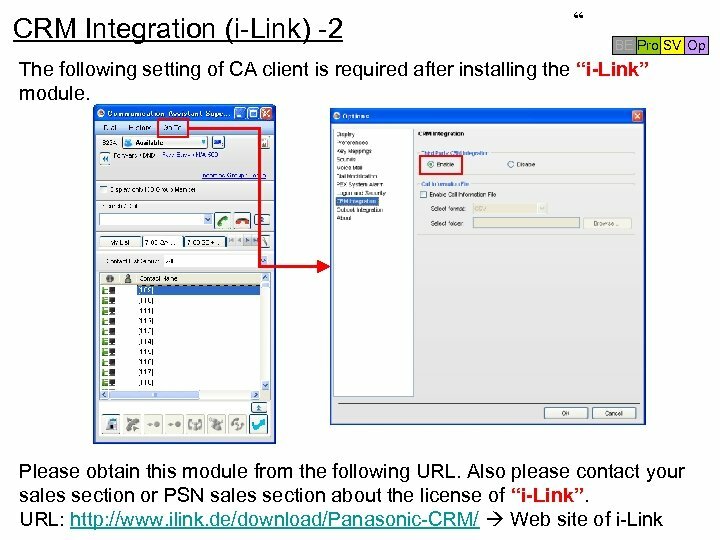 0 (Summary) --- Edition 2 --- Panasonic System Networks CO. , LTD.
“ Enhance Points of CA V 4. 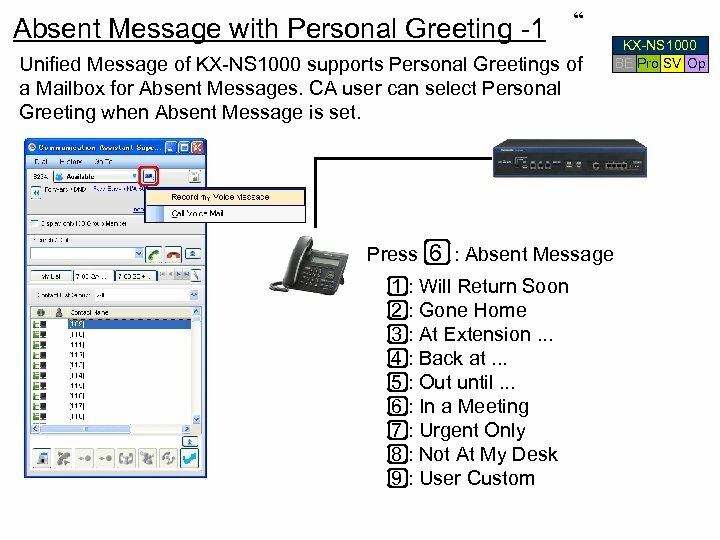 0 - 1 : KX-NS 1000 : With CA Server Basic. 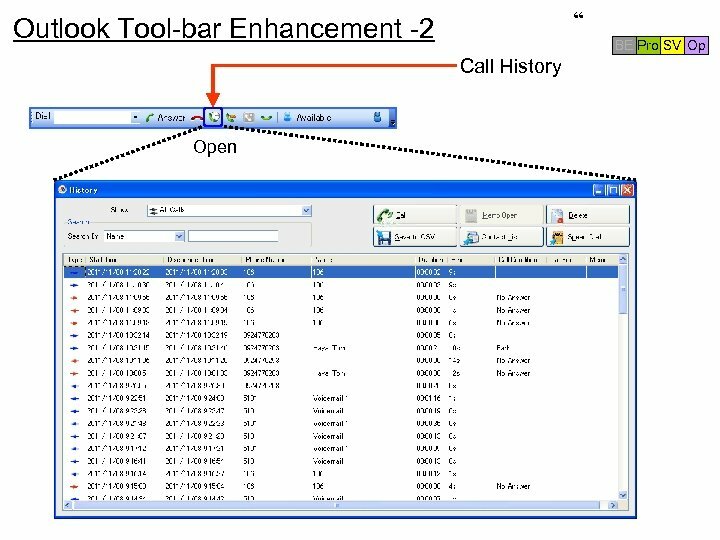 Express Pro Supervisor Operator Console Yes Yes (*1) Yes Yes (*2) Yes CRM Integration (i-Link) (*3) No Yes MS Exchange Scheduler Integration (*4) No Yes ACD Report (Collaboration with CCView) (*5) No Yes Missed Call Log No Yes Feature KX-UT Series SIP Telephone 16 Sites Support (Up to 1, 022 clients) UM (Unified Message) Outlook Tool-bar Enhancement (*1) Up to 240 clients (PBX mode) (*2) History and Presence features are not available. 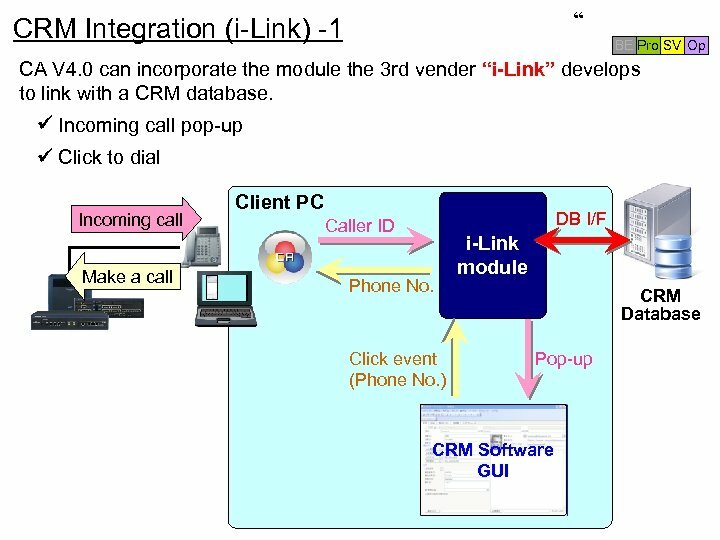 (*3) “i-Link” is CRM Integration module which 3 rd vendor develops. 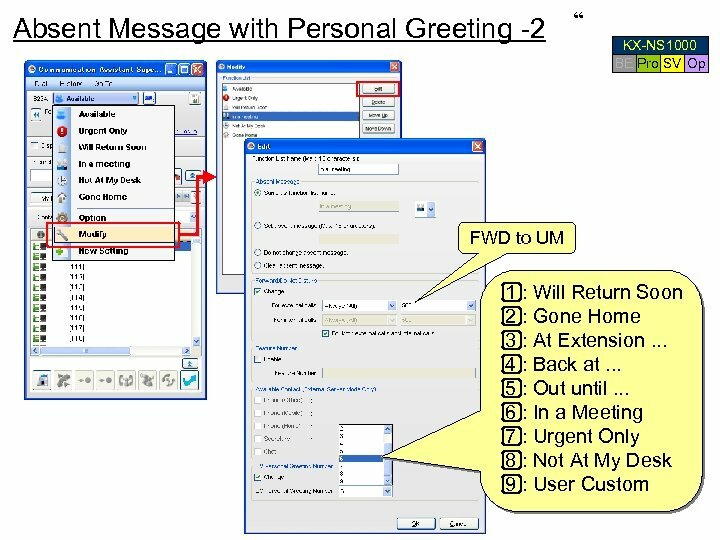 (*4) VM greeting message is not changed in case of KX-TDE/NCP series. 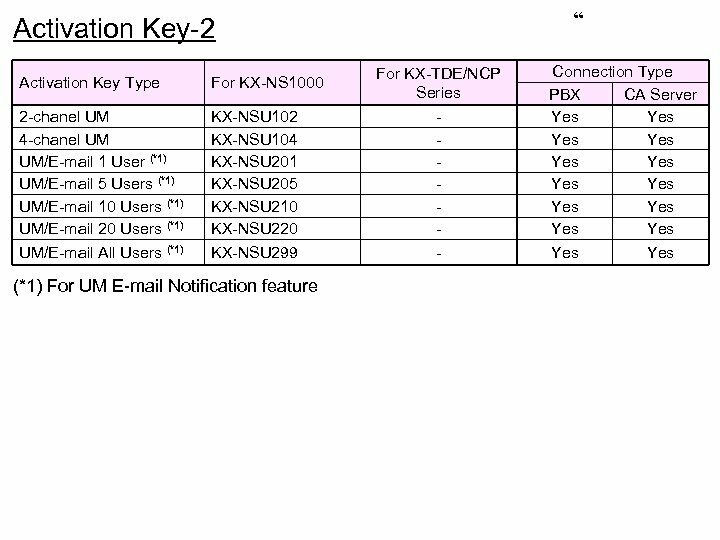 (*5) Activation Key (KX-NSF 101: 3 rd Party CTI Link) is required in case of KX-NS 1000. 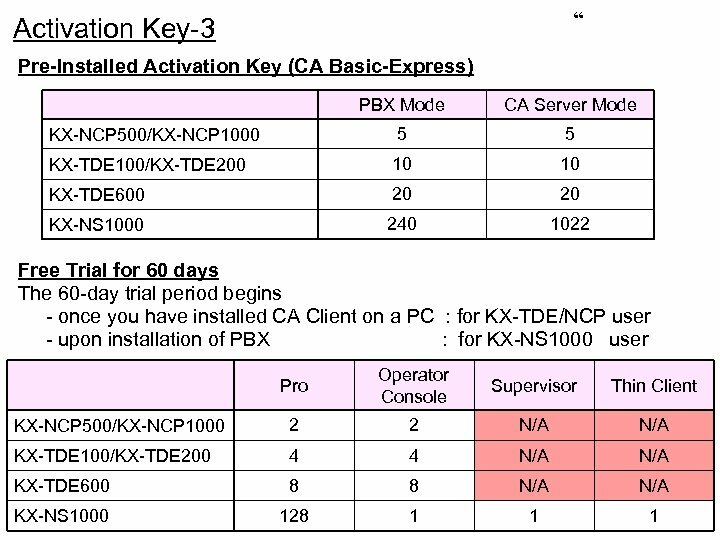 (*5) Activation Key of CSTA MUX is required too, when CA Server is installed. 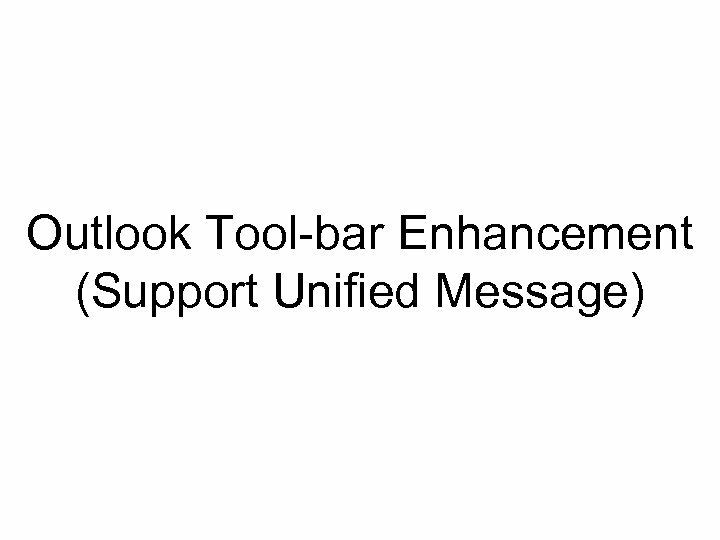 “ Outlook Tool-bar Enhancement -4 BE Pro SV Op Presence Pro SV Op Click Open your presence window. 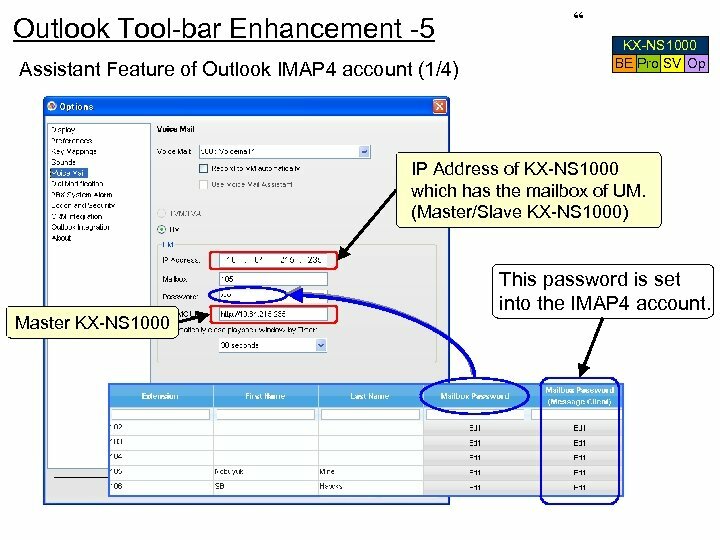 Outlook Tool-bar Enhancement -5 Assistant Feature of Outlook IMAP 4 account (1/4) “ KX-NS 1000 BE Pro SV Op IP Address of KX-NS 1000 which has the mailbox of UM. 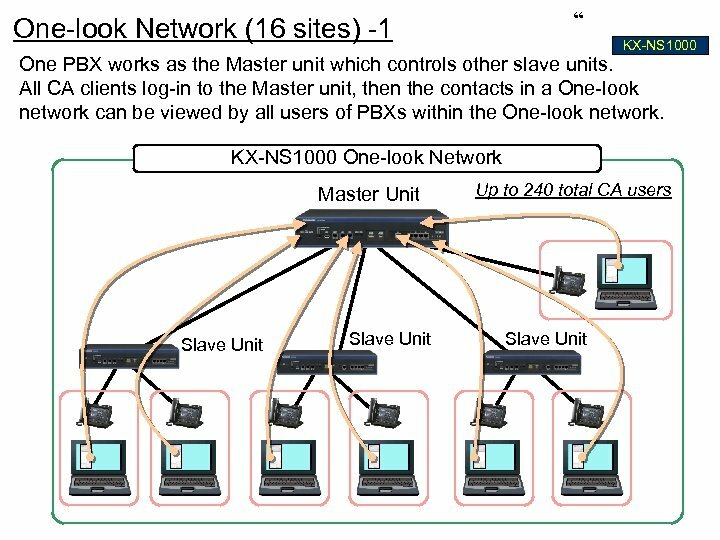 (Master/Slave KX-NS 1000) Master KX-NS 1000 This password is set into the IMAP 4 account. 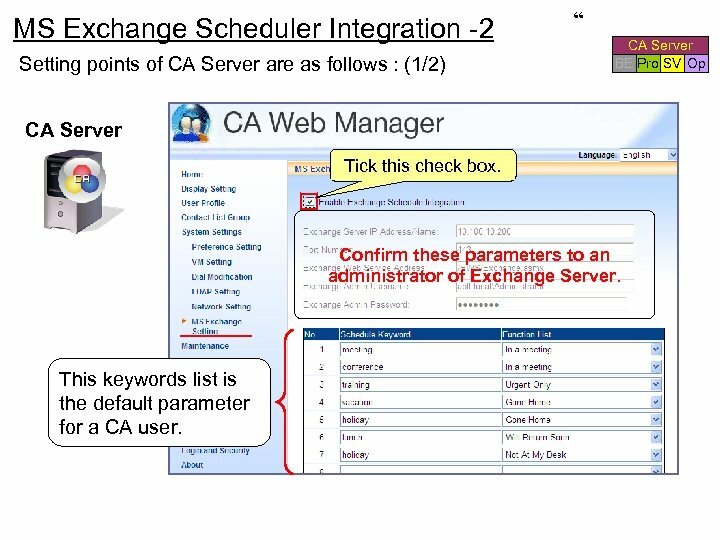 MS Exchange Scheduler Integration -2 Setting points of CA Server are as follows : (1/2) “ CA Server BE Pro SV Op CA Server Tick this check box. 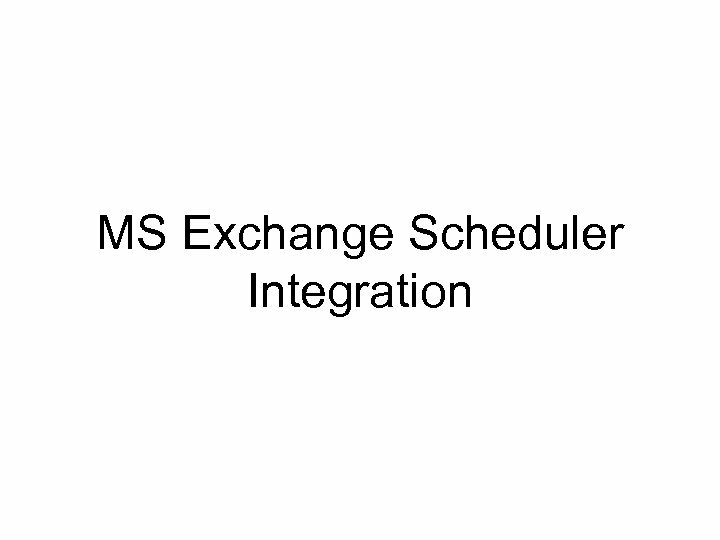 Confirm these parameters to an administrator of Exchange Server. 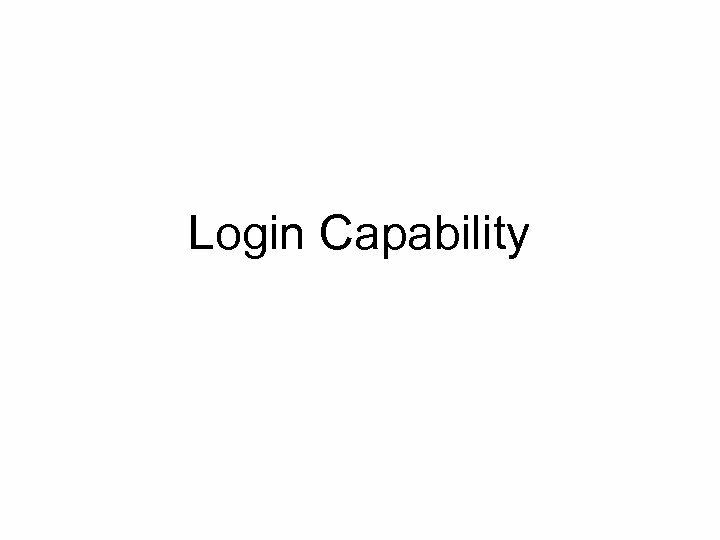 This keywords list is the default parameter for a CA user. 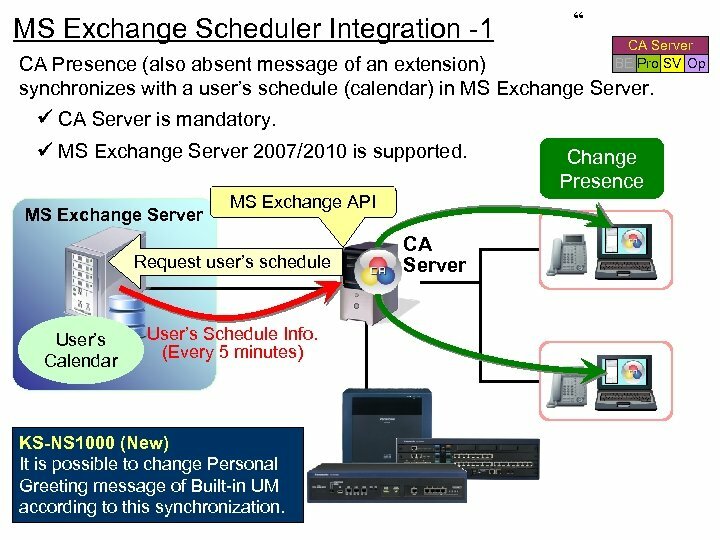 MS Exchange Scheduler Integration -3 Setting points of CA Server are as follows : (2/2) “ CA Server BE Pro SV Op CA Server Set the user account for each CA user. 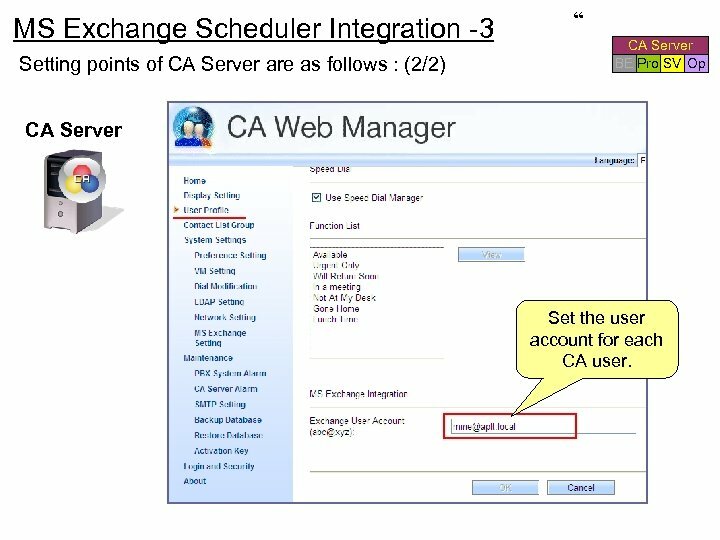 MS Exchange Scheduler Integration -4 “ CA Server BE Pro SV Op Setting points of CA Client are as follows : CA Client Tick this check box. 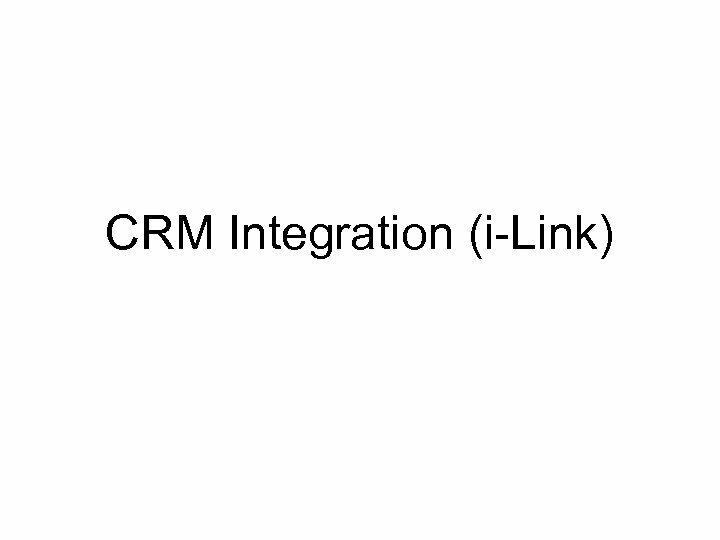 We can modify the table of keywords. 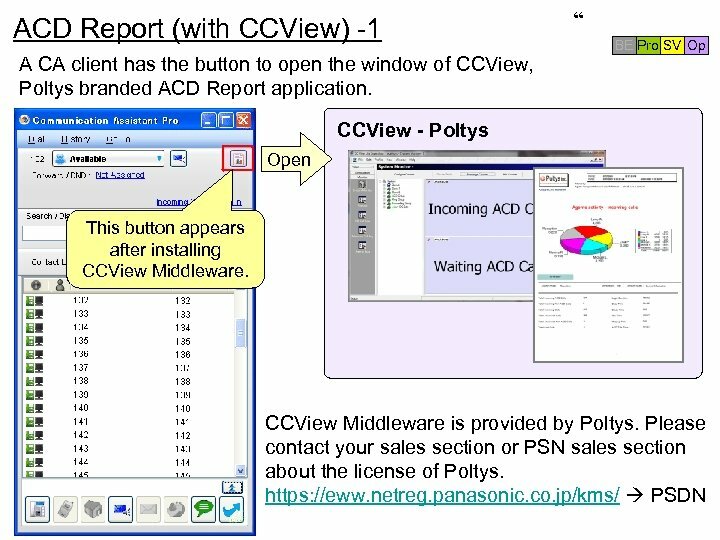 ACD Report (with CCView) -2 Poltys CCServer “ BE Pro SV Op ta tor Da oni CD M A KS-NS 1000 KX-NSF 101 (3 rd Party CTI Link) is required to connect a CCServer to a KX-NS 1000. 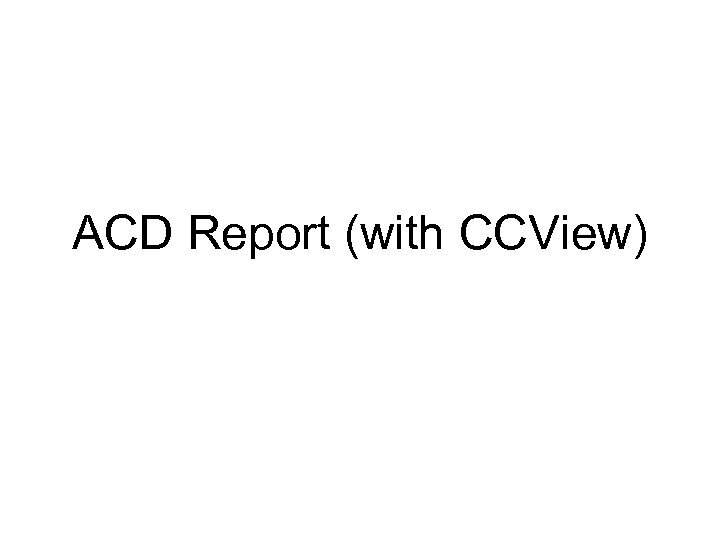 Note : CA and CCView are two separate applications. 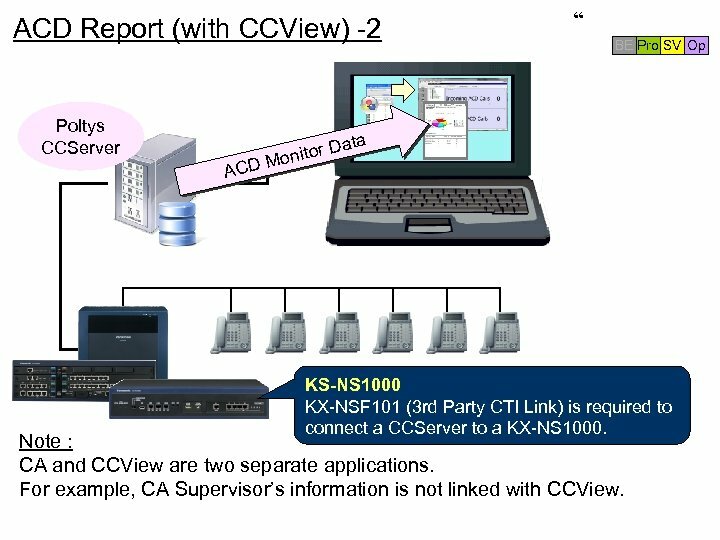 For example, CA Supervisor’s information is not linked with CCView. 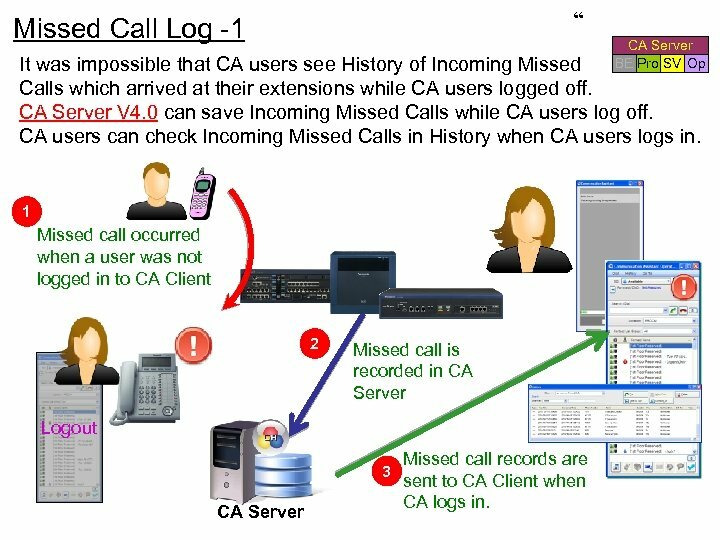 “ Missed Call Log -1 CA Server BE Pro SV Op It was impossible that CA users see History of Incoming Missed Calls which arrived at their extensions while CA users logged off. 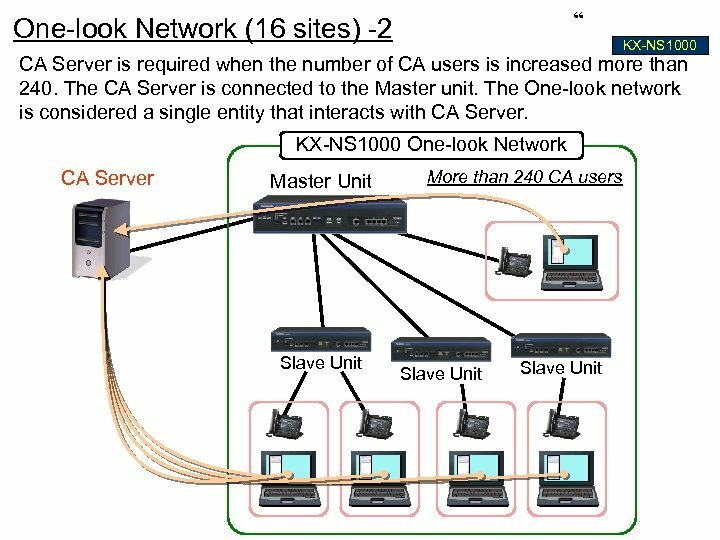 CA Server V 4. 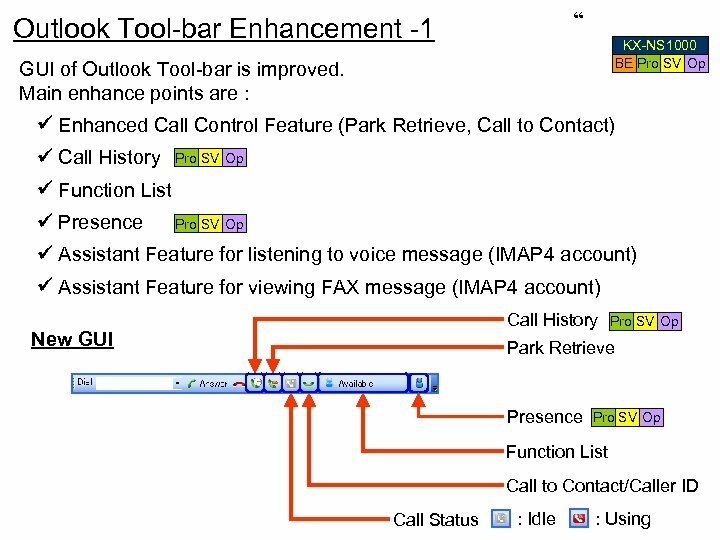 0 can save Incoming Missed Calls while CA users log off. 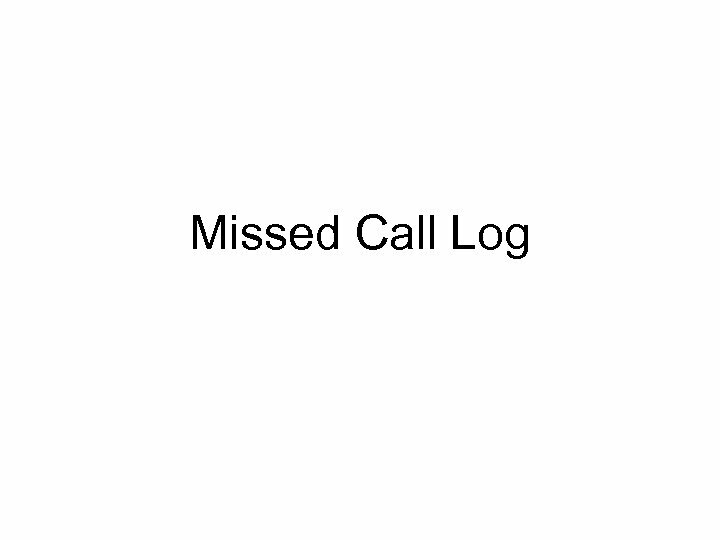 CA users can check Incoming Missed Calls in History when CA users logs in. 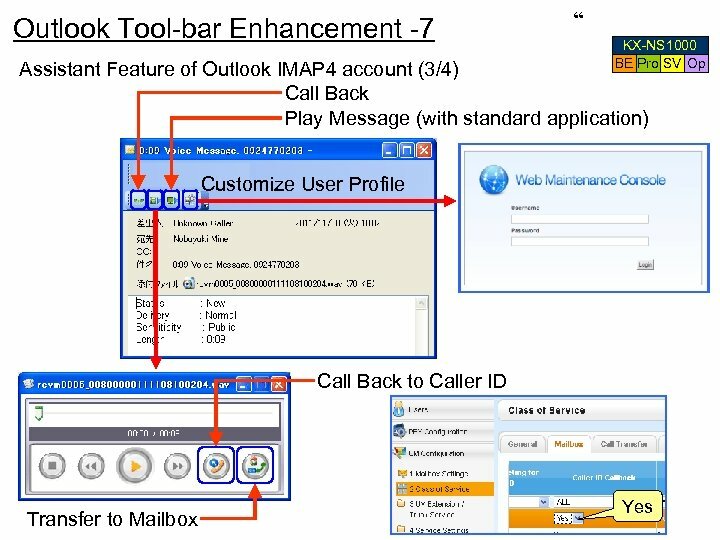 1 Missed call occurred when a user was not logged in to CA Client 2 Missed call is recorded in CA Server Logout 3 CA Server Missed call records are sent to CA Client when CA logs in. 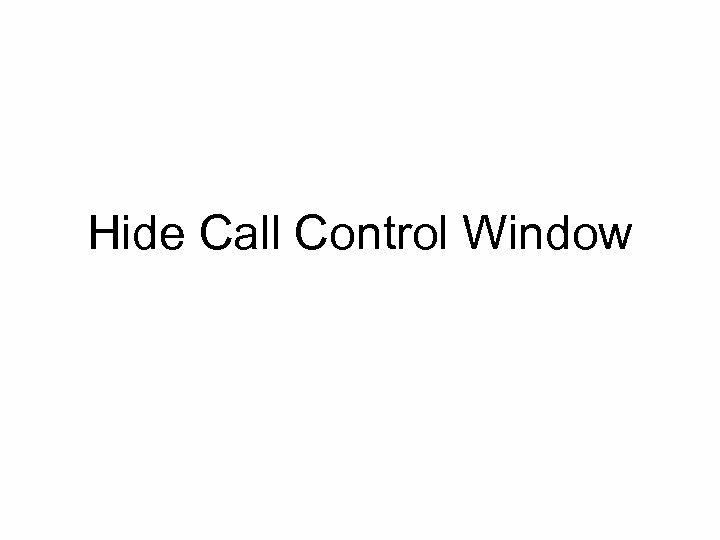 Hide Call Control Window -1 “ BE Pro SV Op Call Control window doesn’t appear. 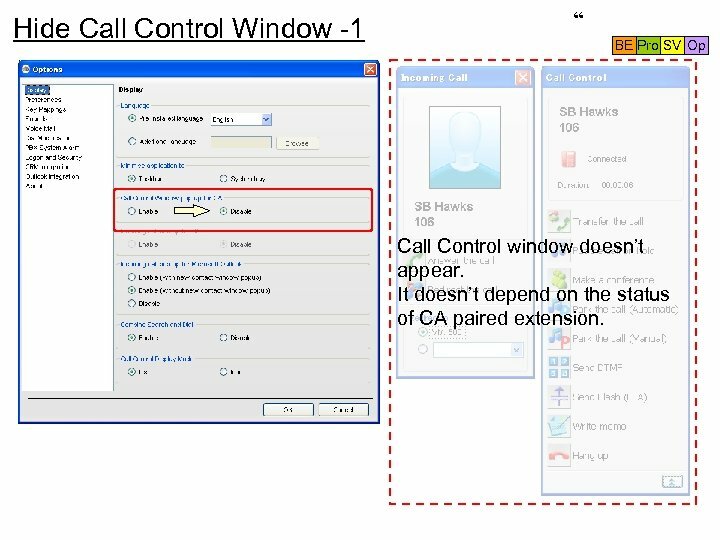 It doesn’t depend on the status of CA paired extension. 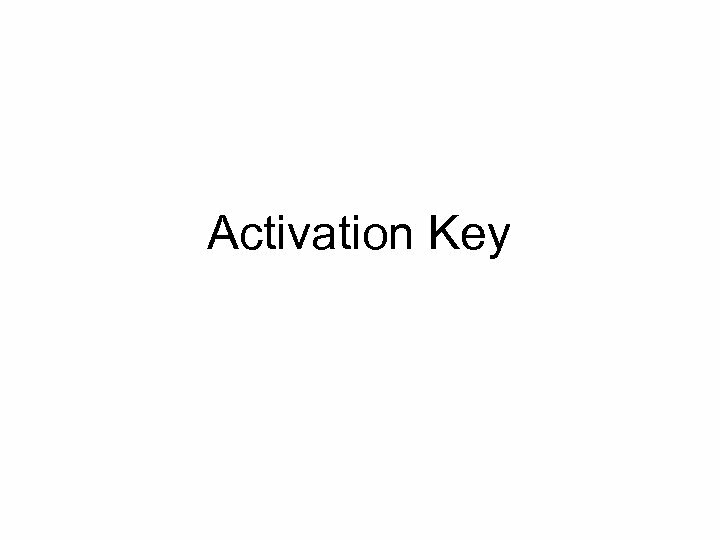 “ Activation Key-1 Activation Key Type For KX-NS 1000 CA Pro 1 User CA Pro 5 Users CA Pro 10 Users CA Pro 40 Users KX-NSA 201 KX-NSA 205 KX-NSA 210 KX-NSA 240 KX-NCS 2201 KX-NCS 2205 KX-NCS 2210 KX-NCS 2240 Connection Type PBX CA Server Yes Yes CA Pro 128 Users KX-NSA 249 KX-NCS 2249 Yes CA Supervisor CA Operator Console CA Thin Client CA Network 1 User CA Network 5 Users CA Network 10 Users CA Network 40 Users CA Network 128 Users CSTA Multiplexer 3 rd Party CTI Link (*1) KX-NSA 301 KX-NSA 401 KX-NSA 010 KX-NSA 901 KX-NSA 905 KX-NSA 910 KX-NSA 949 KX-NSA 020 KX-NSF 101 KX-NCS 2301 KX-NCS 2401 KX-NCS 2010 KX-NCS 2901 KX-NCS 2905 KX-NCS 2910 KX-NCS 2949 KX-NCS 2020 - Yes Yes Yes Yes For KX-TDE/NCP Series (*1) KX-NSF 101 is required when Poltys’ CC View application is installed. 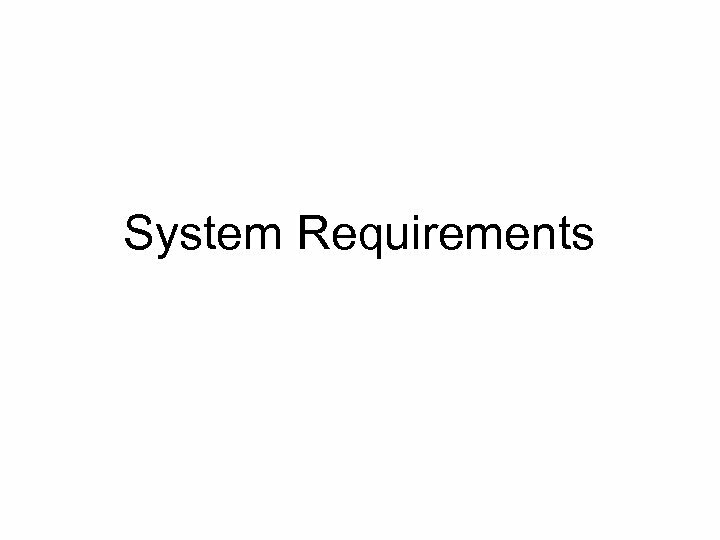 “ System Requirements - PBX CA Server BE Pro SV Op To use CA, the software of your PBX should be matched with the : Enhance Key is needed requirements listed below. 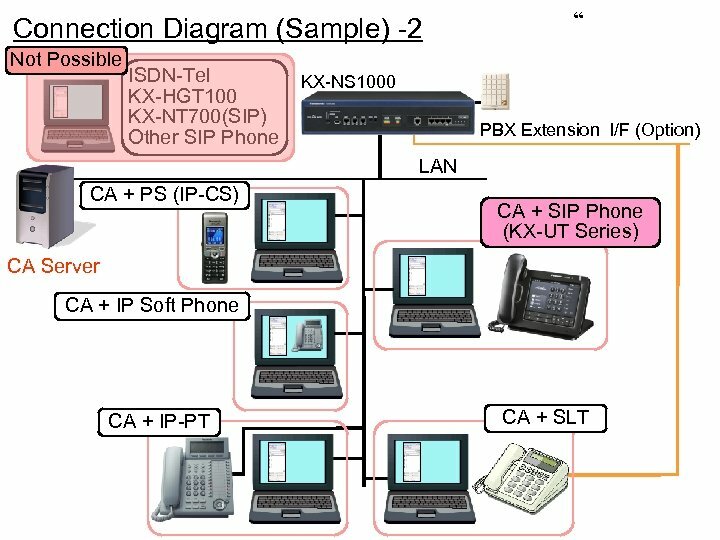 KX-TDE 100 KX-TDE 200 KX-TDE 600 CA V 1. 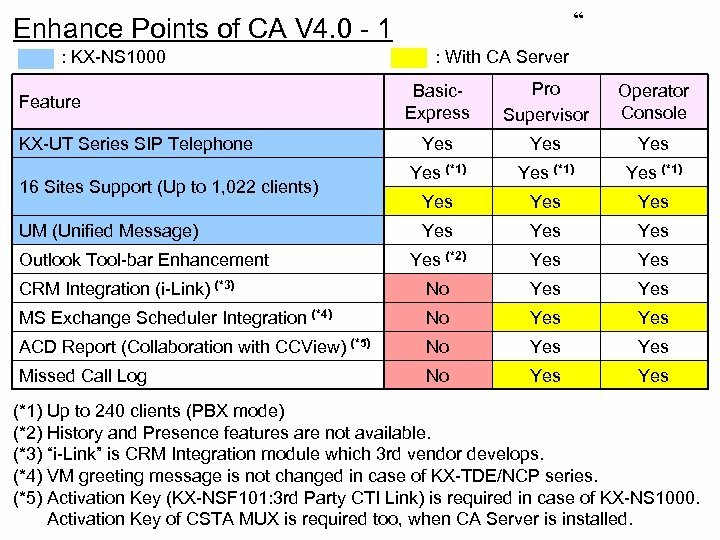 5 with CA Server CA V 1. 5/V 2. 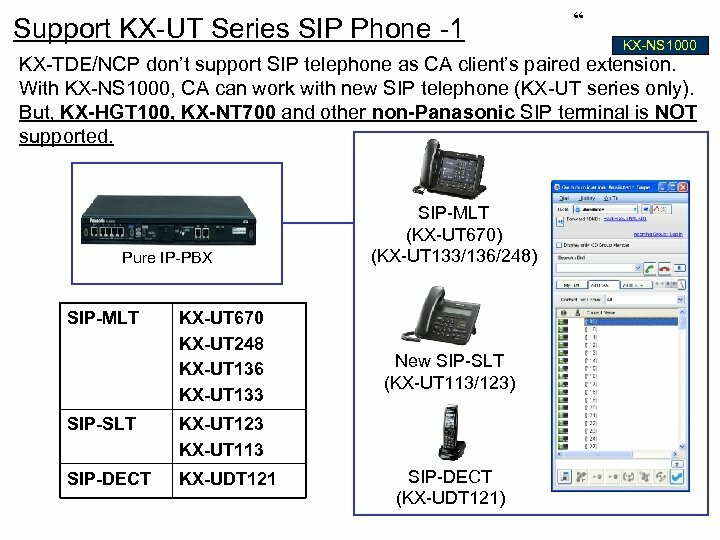 0 Server-less (PBX Connection) KX-NS 1000 - V 1. 0 - V 2. 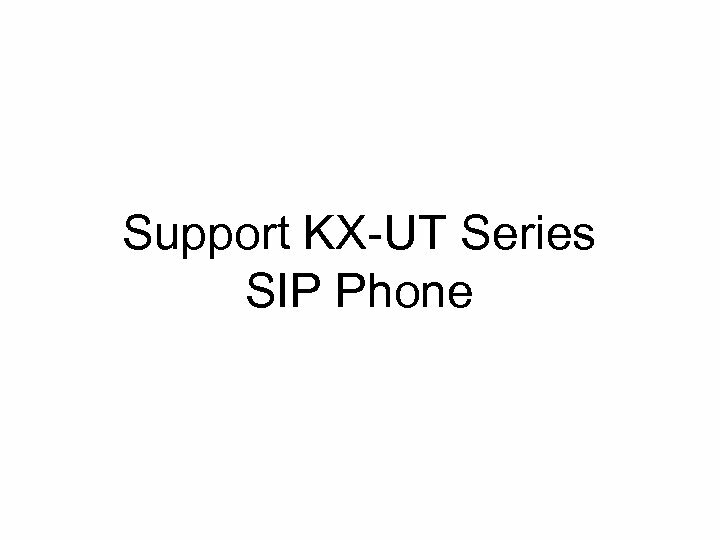 01 (KX-TDE 100/200) V 2. 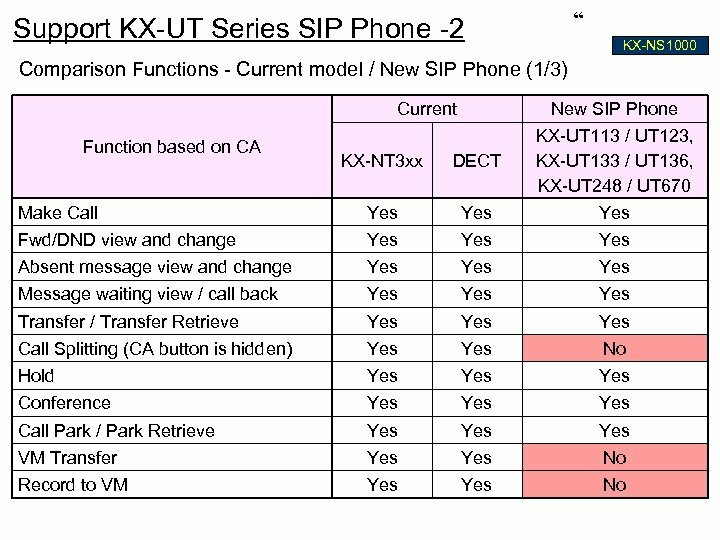 00 (KX-TDE 600) V 1. 0 V 3. 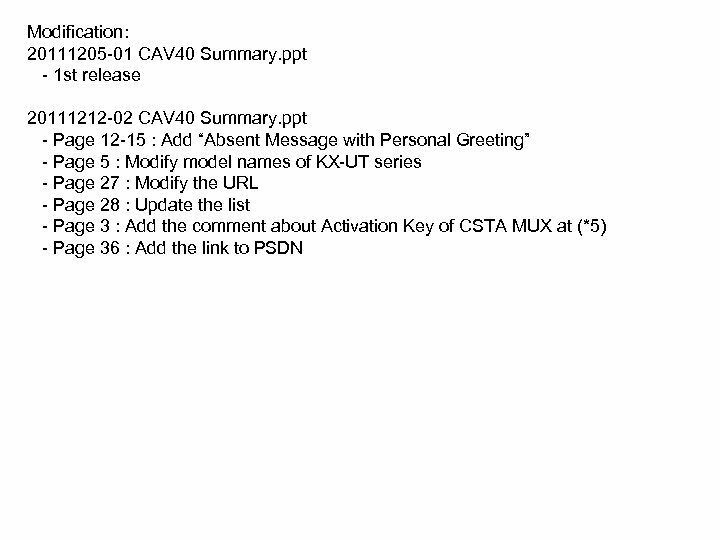 0 CA V 1. 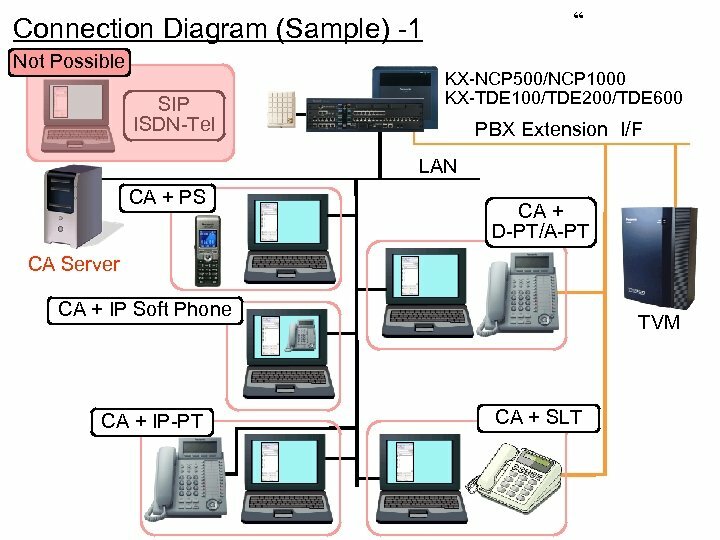 0 KX-NCP 500 KX-NCP 1000 V 2. 0 V 3. 0 - V 1. 0 - V 2. 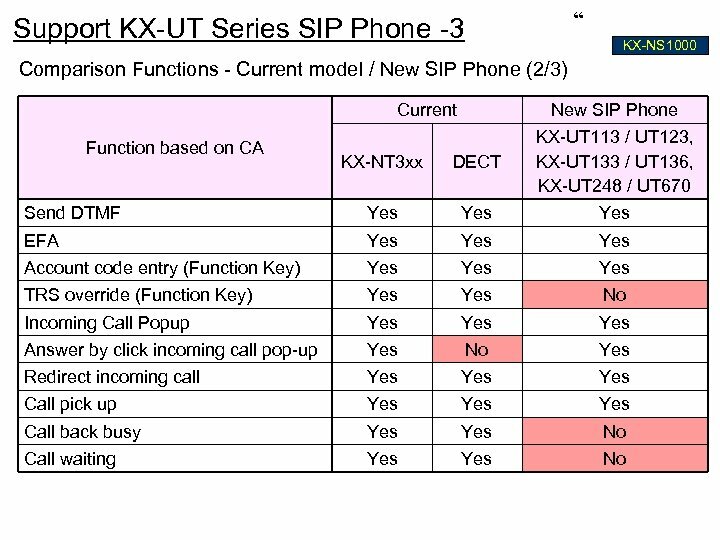 0 - CA V 2. 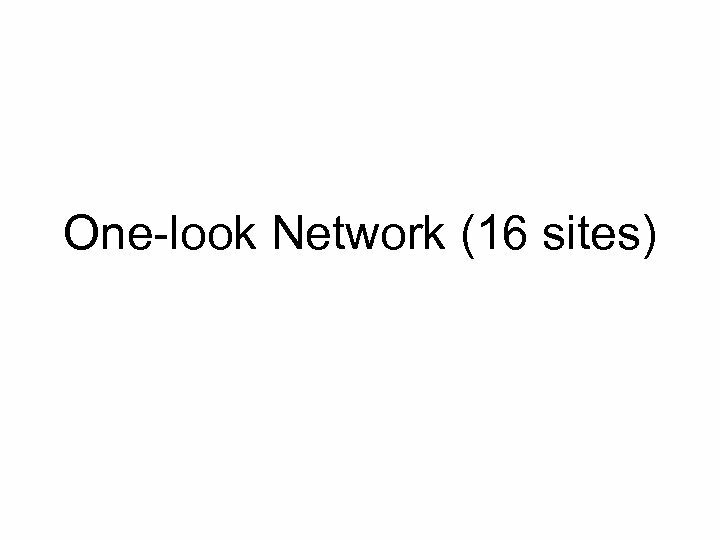 0 with CA Server V 3. 0000 V 2. 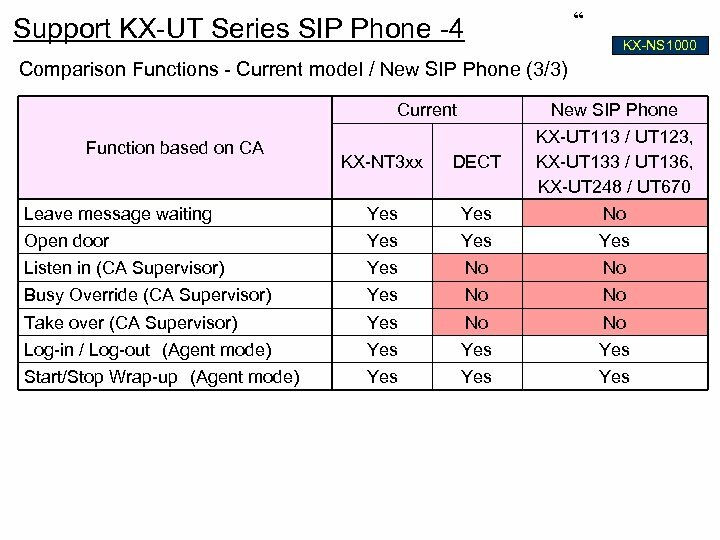 01 - CA V 3. 0 V 4. 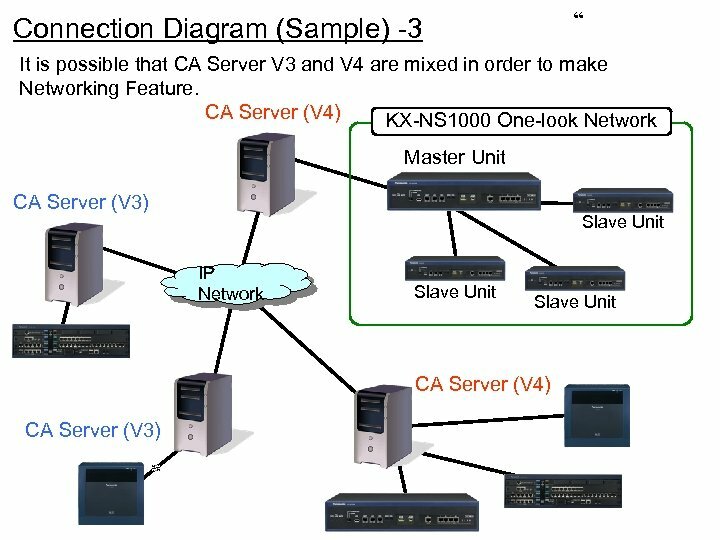 1000 - CA V 4. 0 V 4. 1000 or later V 1. 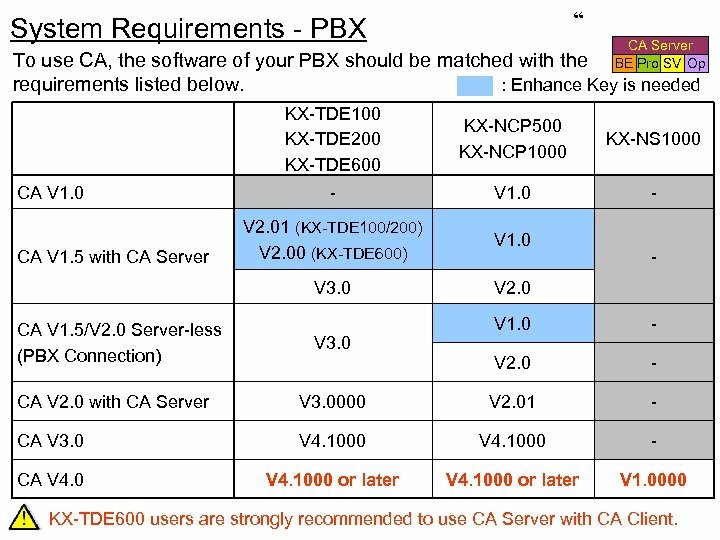 0000 KX-TDE 600 users are strongly recommended to use CA Server with CA Client. 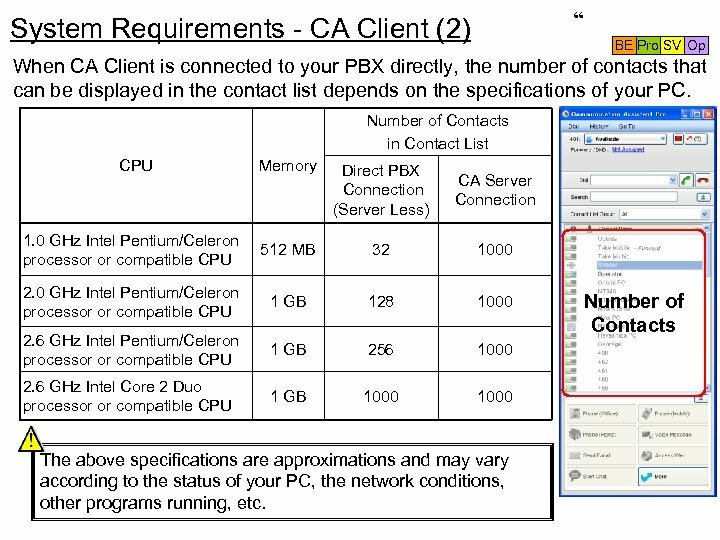 System Requirements - CA Client (3) “ BE Pro SV Op There is a phenomenon that the working of CA becomes slow depending on the number of contacts in the contact list of CA in PBX mode (Server Less/Direct PBX Connection). 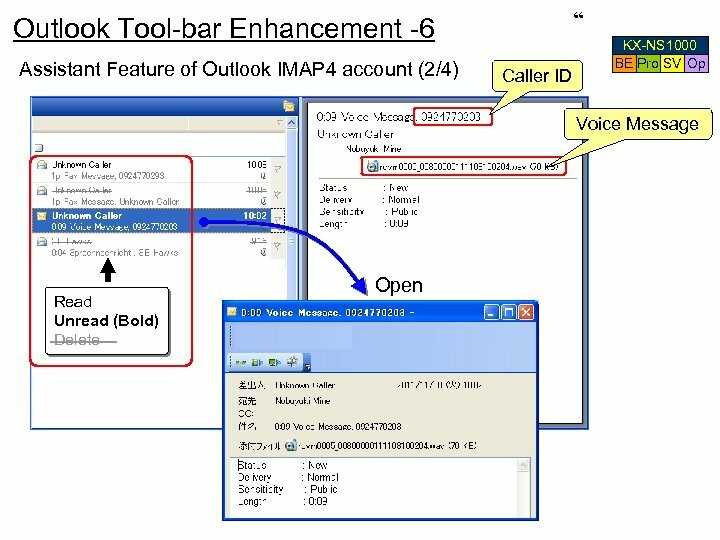 Please refer to the table from the result of our test on the previous page. It is a matter that requires attention. 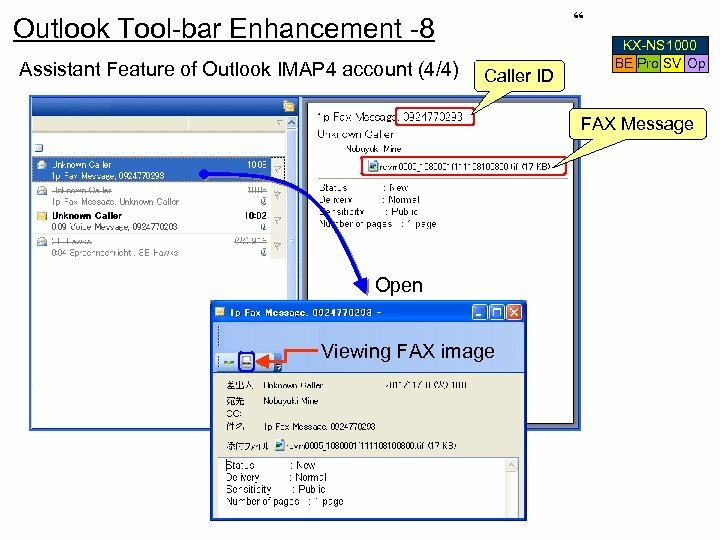 (We tested with the PC in which other application is not running. ) 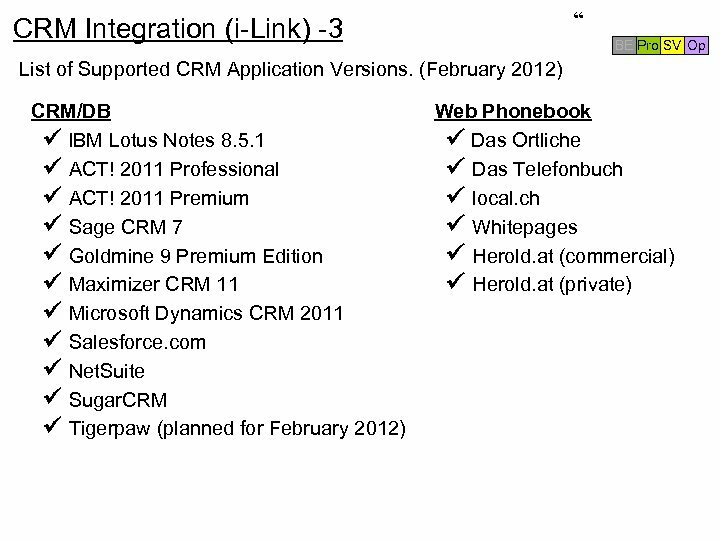 Number of Contacts CA does not restrict the number of contacts from the specification of PC. 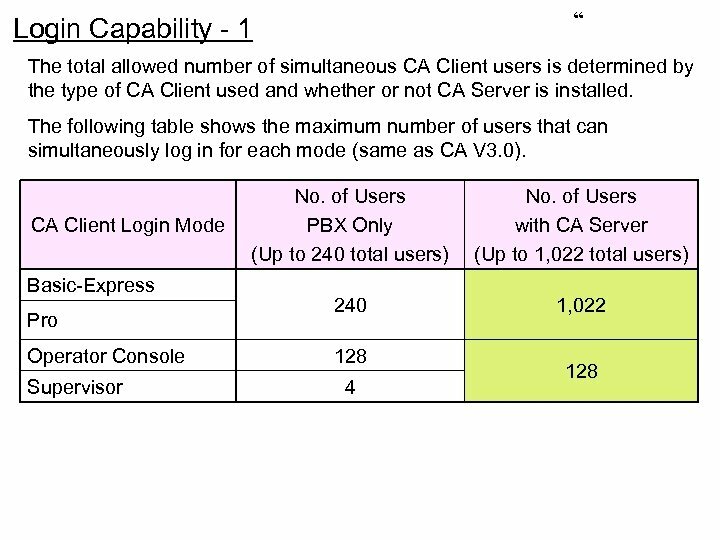 Therefore, CA user's feeling will not change even if the number written in this table is exceeded a little (For example, even if it is 32 or it is 33), but CA user may be going to feel slow depending on the situation of PC. 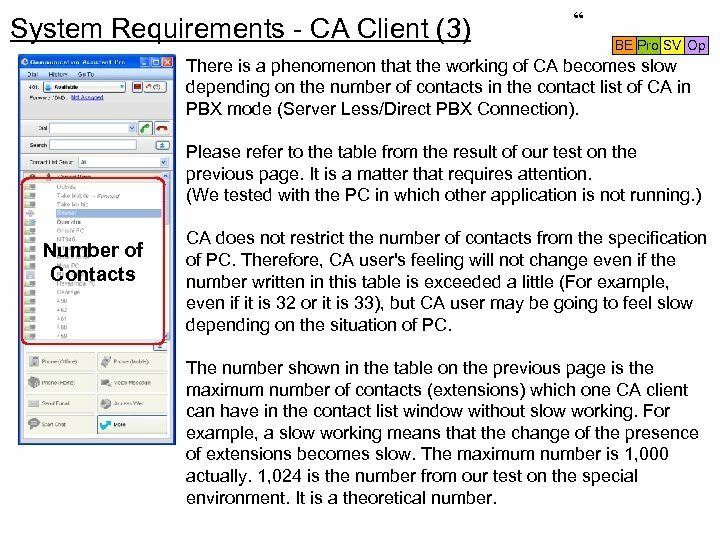 The number shown in the table on the previous page is the maximum number of contacts (extensions) which one CA client can have in the contact list window without slow working. 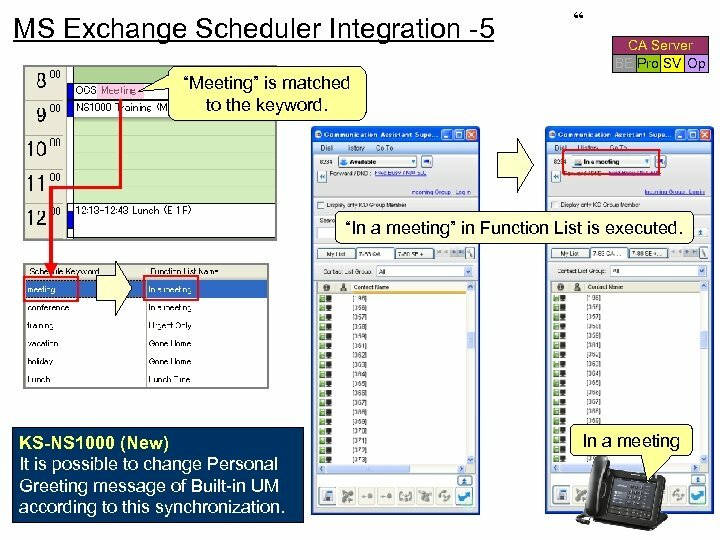 For example, a slow working means that the change of the presence of extensions becomes slow. The maximum number is 1, 000 actually. 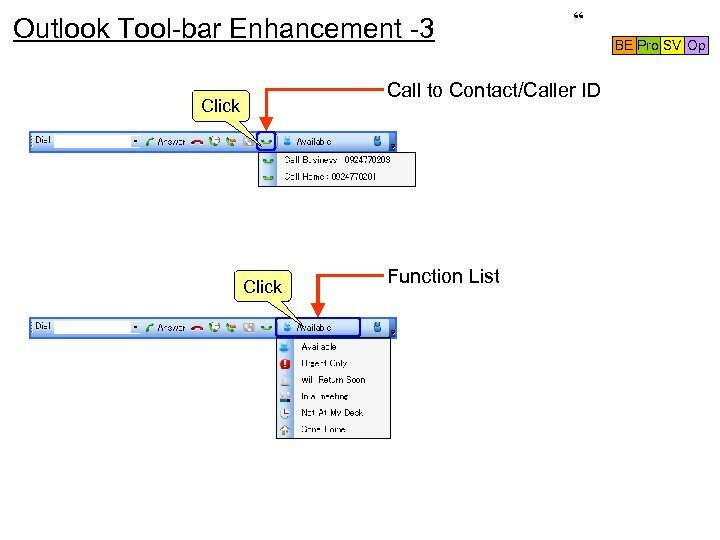 1, 024 is the number from our test on the special environment. It is a theoretical number. 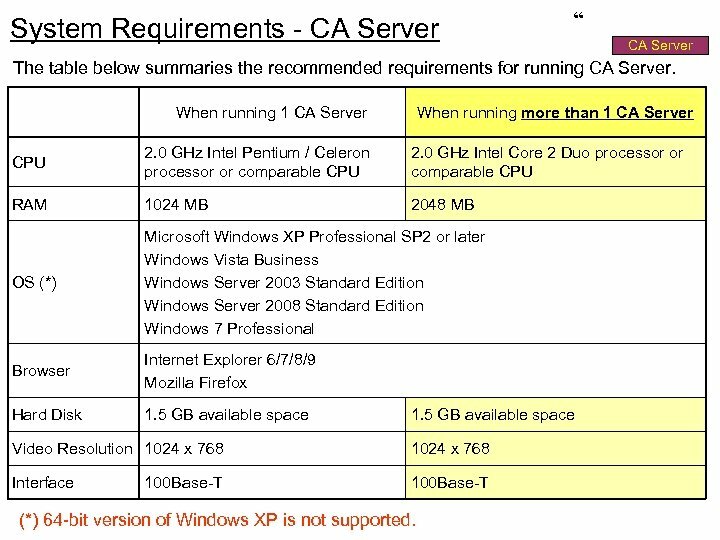 System Requirements - CA Server “ CA Server The table below summaries the recommended requirements for running CA Server. 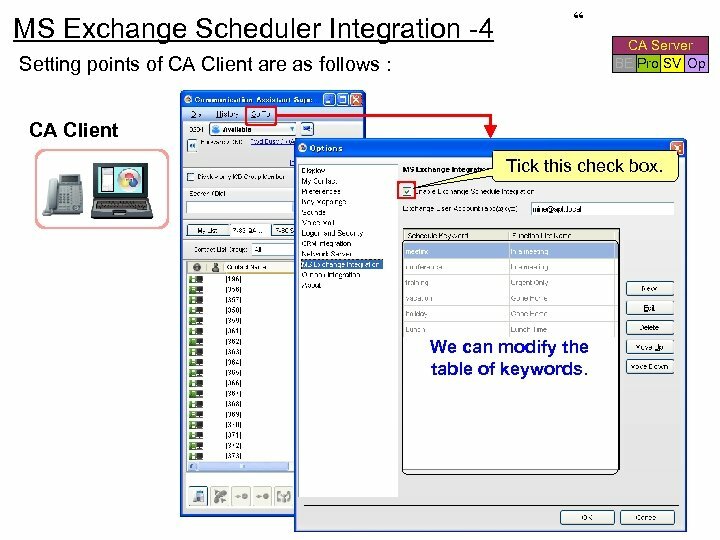 When running 1 CA Server When running more than 1 CA Server CPU 2. 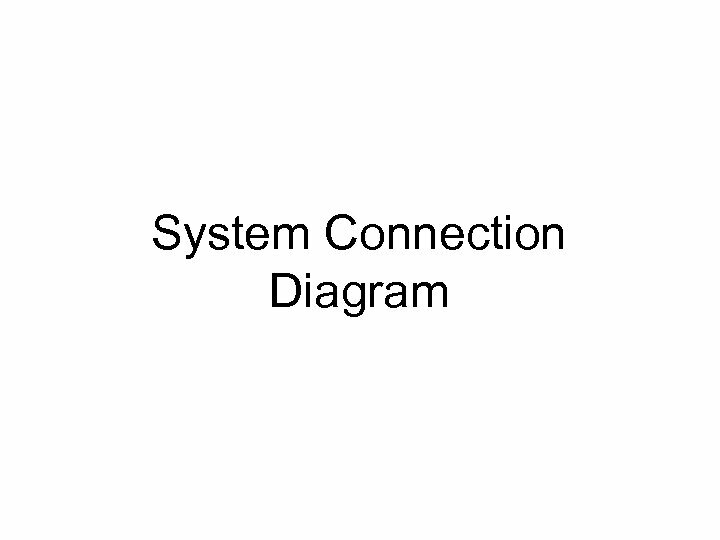 0 GHz Intel Pentium / Celeron processor or comparable CPU 2. 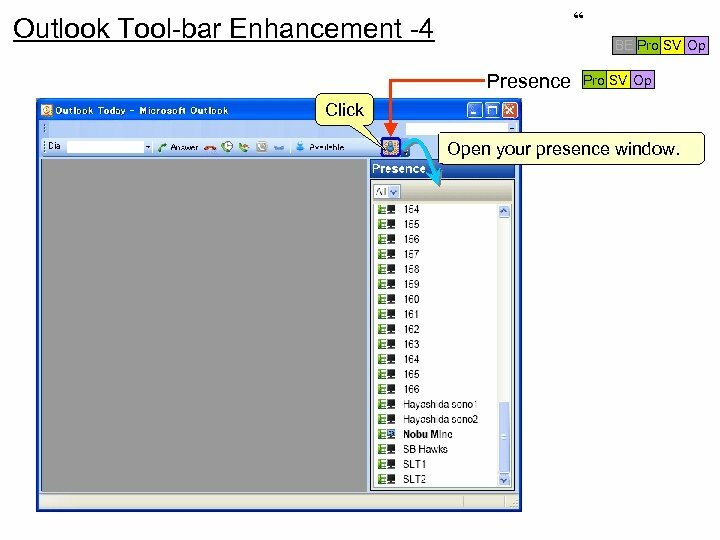 0 GHz Intel Core 2 Duo processor or comparable CPU RAM 1024 MB 2048 MB OS (*) Microsoft Windows XP Professional SP 2 or later Windows Vista Business Windows Server 2003 Standard Edition Windows Server 2008 Standard Edition Windows 7 Professional Browser Internet Explorer 6/7/8/9 Mozilla Firefox Hard Disk 1. 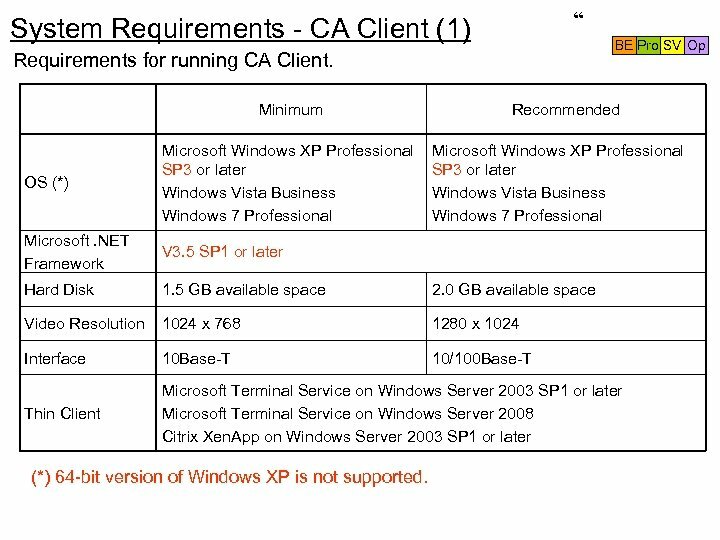 5 GB available space Video Resolution 1024 x 768 100 Base-T Interface (*) 64 -bit version of Windows XP is not supported. 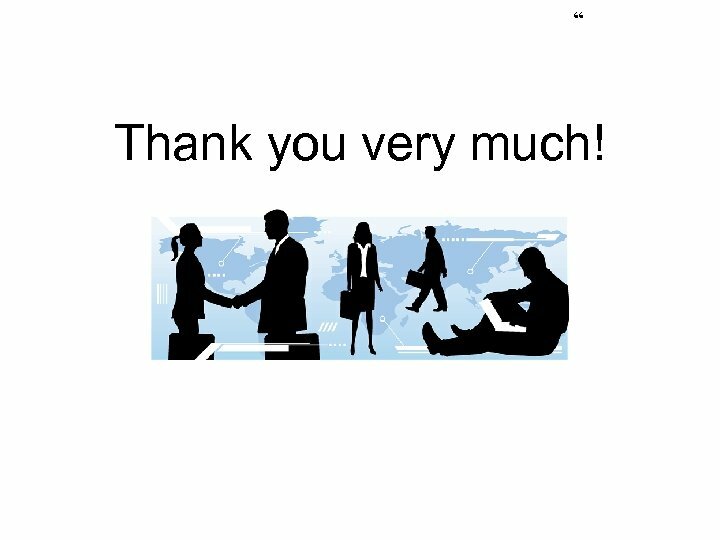 “ Thank you very much! 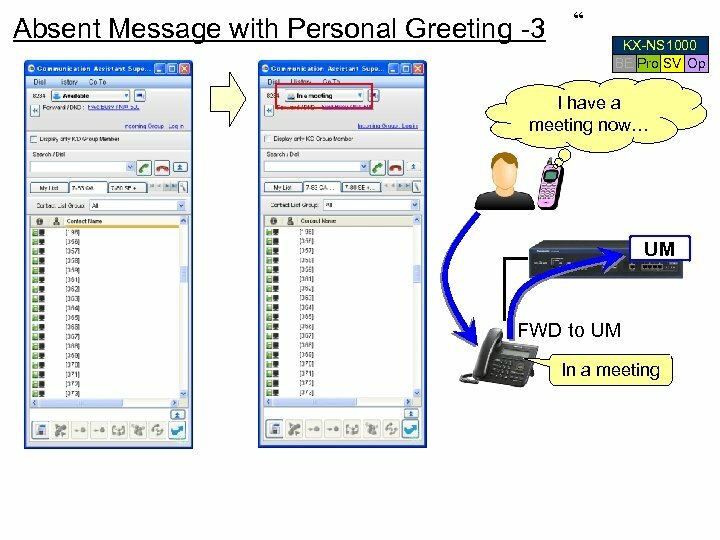 CULTURE AND COMMUNICATIONMade by: Ibirkhanov A. N gr.